Motorola’s Mods have been wide-ranging attempts to trick out your smartphone with sizeable gadgets, from a 360-degree camera to a standalone speaker with Amazon Alexa. 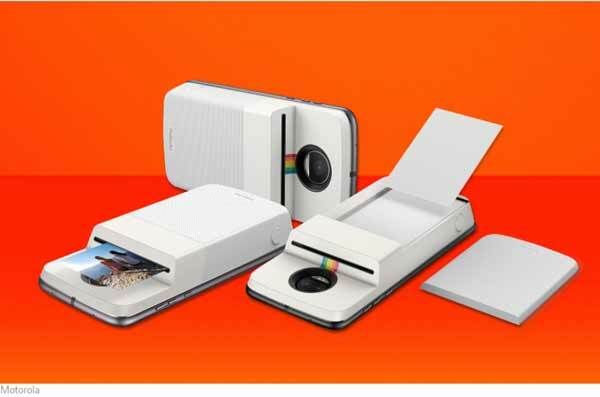 Their next one might be more appealing to casual Moto Z smartphone owners: A Polaroid-brand printer case for the Moto Z that pumps out photos. The Polaroid Insta-Share Printer, as it’s called, looks like a little angular box snapped to the phone like a backpack. Crucially, it’s got a shutter button that, combined with the printer’s heft and shape, should make smartphone photography far less cumbersome. The mod uses Polaroid’s proprietary Zero-Ink Paper format to produce 2-inch by 3-inch photos you’ve saved locally or from Facebook, Instagram or Google Photos. Motorola’s website and Verizon stores will start selling Polaroid’s Moto Mod this Friday in the US, November 17th, where it retails for $200. Best Buy, B&H, Fry’s and NewEgg will have it starting December 13th.